Considered dangerous in the past, today Colombia’s second largest city is a favourite destination for many travellers. With so many things to do in Medellin, places to visit and restaurants to try, rest assured you will have a great time. 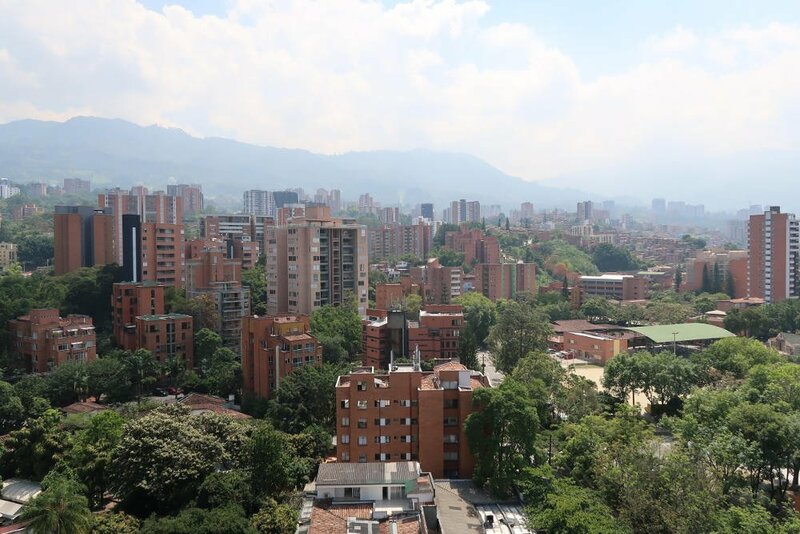 Read on to discover what to do in Medellin to experience the city like a local. Did you know Medellin is getting more and more popular with tourists by the day? 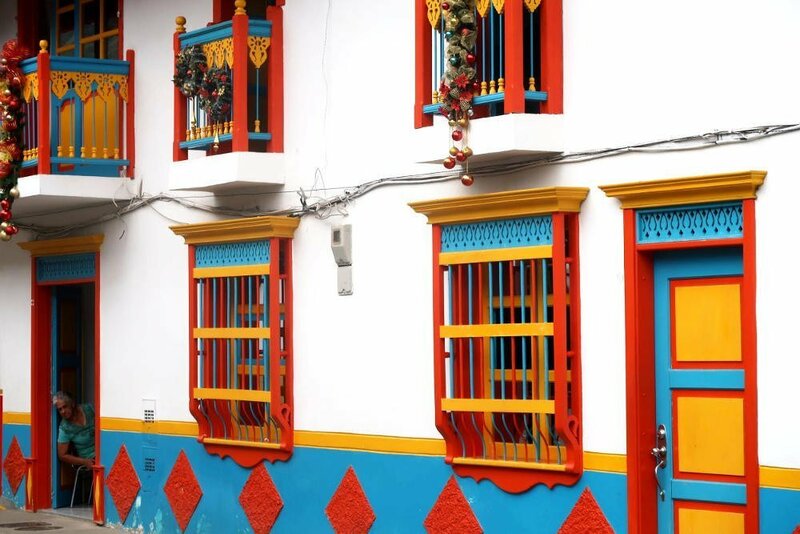 If a trip to Colombia is on your bucket list, and you’re thinking of visiting the Antioquia region, make sure you check out this list of top things to do in Medellin. After spending so much time backpacking in South America, I decided to stay in Medellin and I assure you, with so many things to do here, you’ll find yourself not wanting to leave. Tip: Search for great hotels in Medellin and compare the prices. If you’re arriving in Medellin from the international airport in Rionegro you’ll be glad to know you can save money by getting a bus that stops right outside the airport terminal. The bus will drop you close to the centre so you can easily flag down a taxi to take you to your desired destination. If it’s your first time in Medellin, I recommend you look at one of the many accommodation options in the Poblado area of the city. Once you’ve got yourself settled in, you can begin to explore some of the best things to do in Medellin which I’m going to introduce to you below. El Poblado is the Zona Rosa area of the city. It’s located in the mountains but very walkable once you’ve arrived at Lleras park. 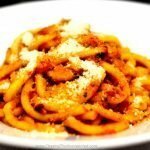 You’ll find some of the best restaurants in town along with a very lively night scene. If you drink coffee, El Poblado is one the best places you could visit in Medellin. El Poblado is home to my favourite coffee shops in the city and where you can also find a superior cup of coffee. My favourite coffee shop is Cafe Pergamino. 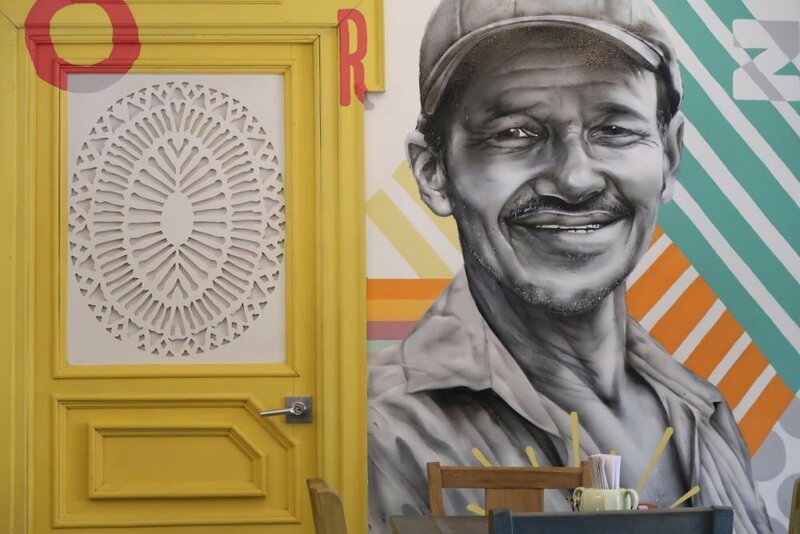 You’ll sample some local coffee harvests that are only available in Colombia, not to mention, you can choose from a wide range of brewing methods to suit your liking. Aeropress and Chemex make the perfect brew. If you’re situated in the Poblado area you can easily reach Mercado del Rio within walking distance. This is a modern space and filled with restaurants offering all different types of food. It has an inviting ambience so make sure you take a good look around before settling for the first restaurant you see. Whenever I get the chance, relaxing in the Botanical Gardens is one of my favourite things to do in Medellin. It feels nice to be in a mini forest with wild animals. On a hot sunny day, a trip to the Botanical gardens is a must. Even if it’s just for an hour or two. I can arrive here very easily by catching the Metro. The great thing about the Botanical gardens is that it’s a free attraction that allows you to escape the madness of the city. At times, I’ve felt like I’m in another dimension sat in here. It’s beautiful, and you’ll find many locals passing time here. It makes the perfect picnic spot whether you love plants or not. The gardens are a safe place to relax and take in the atmosphere. 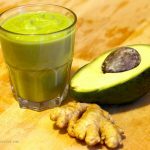 Tip: Try Mango Biche! A commonly found street snack consisting of unripe mango laced with salt and pepper from one of the street vendors outside the Botanical gardens. The Botero Plaza is one of Medellin more renown tourist attractions. The plaza also is very popular with locals and other Colombians visiting Medellin. You’ll encounter 23 humongous bronze sculptures divided between the outdoor display and the indoor museum. The sculptures are big, bold and equipped with exaggerated features. 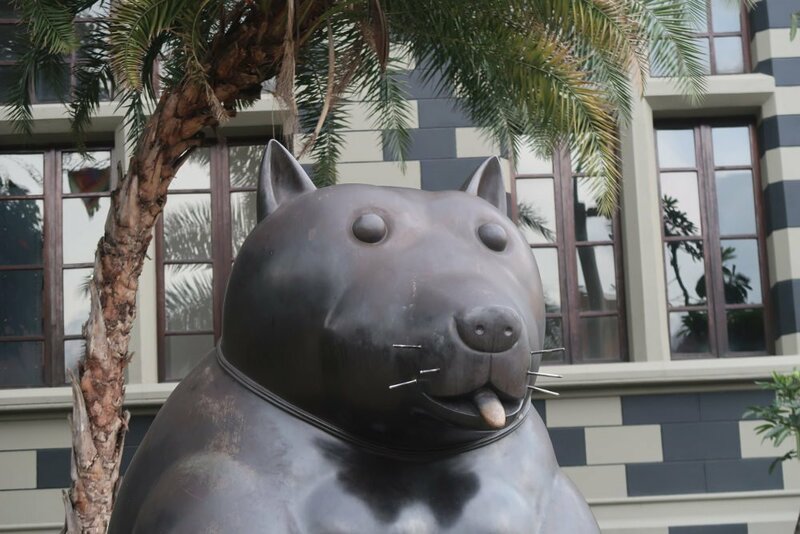 Located in the same area as Botero Plaza you can discover more of Botero work by paying the entrance to this museum. The entire top floor consists of artwork donated by Botero. You can also find work by other Latin American artists. The Museum of Antioquia is a must if you’re a fan of Colombian art and one of the places for your Medellin sightseeing. Medellin is truly a great city to visit as a traveller. Many Paisas (people from Antioquia) though have family in a small place called Jardin. A small coffee town about a 3-hour drive from the centre of Medellin. This town has done a great job of preserving its buildings and local atmosphere. Jardin is known to be very popular with people backpacking Colombia and is famous for its coffee experiences. A short walk around the peaceful and picturesque plaza will not disappoint you. Tip: You can take the bus from the North terminal of the city. Just get off the Metro at station Caribe and cross the bridge over to the North bus terminal. If you want to be hassle-free, book a coffee tour to Jardin from Medellin. Parque Explora is what to see in Medellin if you like science and to learn more about how life works. It’s filled with interactive exhibitions where you can learn about different things. There’s also an aquarium and some small animal exhibitions. It’s located across from the Botanical Gardens I mentioned earlier so you can get to see both in one morning. Tip: Use the Metrocable to arrive here and prepare yourself for a scenic ride by taking a camera with you. This is a cool little place to sit back and people watch in the city centre for a short time. Plaza de San Antonio is home to 4 more of Botero’s statuses with the one that was blown up by the cartels. Keep your wits about you in this area. It can get a bit shady so I recommend visiting in the daytime. The public transport in Medellin is one of the feats that many locals rave about. Riding the Metro and taking a taxi couldn’t be easier. However, if you’d like to soak up the sun rays and protect the environment as you transport yourself around the city, then rent a bike and get some exercise for free. It’s also worth noting that Medellin has something called ‘Ciclo Vias’. This basically means that for one particular day of the week a normal city street gets closed down. This allows citizens and travellers alike to ride along or walk freely for a few hours of the day. 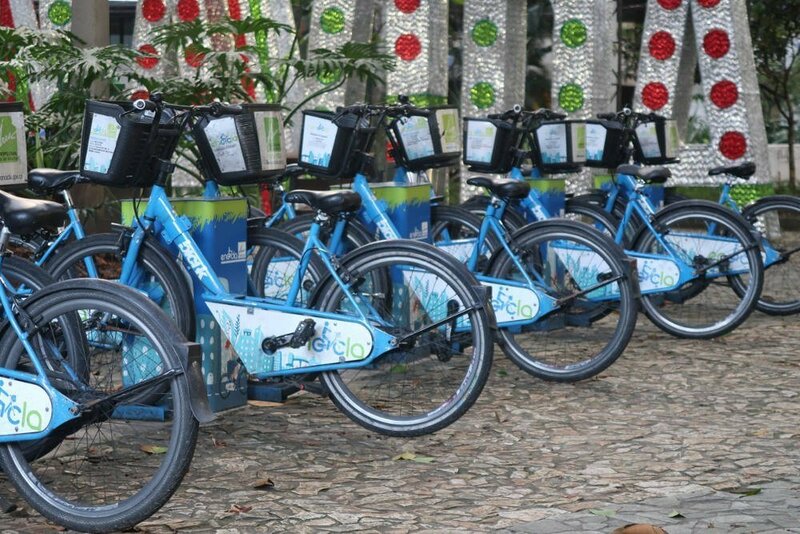 Ciclo vias are very popular with locals and a part of everyday life; they help the environment. Sunday is a great day to experience this, and of course, it’s free to take part. You won’t get much more local than this. If you get the metro to station San Antonio, take a short walk and you’ll find yourself in the city centre. Here you can find this absolute gem. 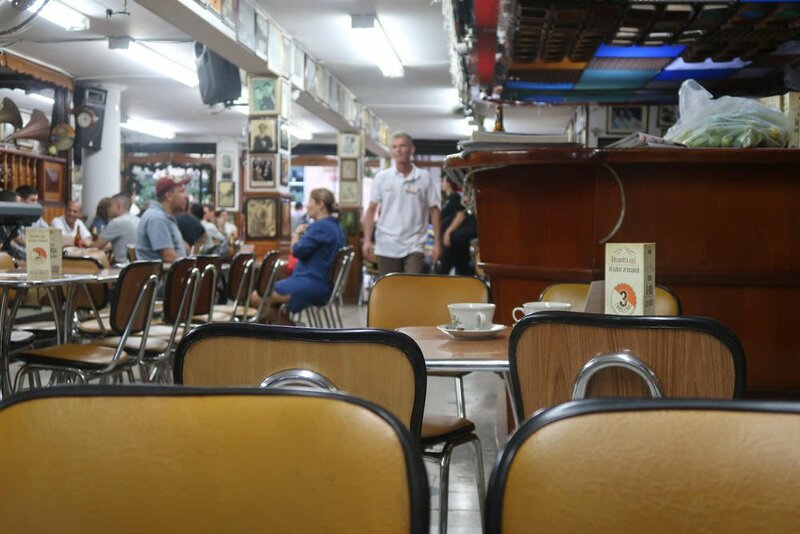 The walls are covered with memorabilia, there are many black and white photos of performing artists – mainly of the tango genre. You can also find tango shows in the evening. Comuna 13 is a must when visiting Medellin. It’s not recommended that you visit without a tour guide. Visiting the Comuna with a small group and tour guide is the key to learning the history and culture of the neighbourhood and why the transformation has been so significant. Tip: Click here to book a tour to Comuna 13 neighbourhood. At Pueblito Paisa you’ll find stunning replicas of colonial houses that represent a typical Antioquenian village. Pueblito Paisa is nicely positioned on top of a hill so you get an amazing view of the rest of the rest of the city. It’s very touristic so you’ll find souvenir shops and places to eat and drink the local specialities. You’ll need to find your way around the city effectively to make the most of your time. If you manage to get access to the Metro you’ll easily be able to ride the Metrocable. Riding the Metro cable gives you access to parts of the city that you may not have otherwise accessed. Using the Metrocable you can get to Parque Arvi which is located in nearby Santa Elena. Tip: You can get yourself a Civica card that will save you time and money instead of queuing to buy tickets. After travelling a lot in Latin America I have found knowing a few basic Spanish phrases can go a long way. As it happens Medellin is a great place to learn Spanish. Many people come here to do exchange programs and you’ll find both public and private lessons around the city. 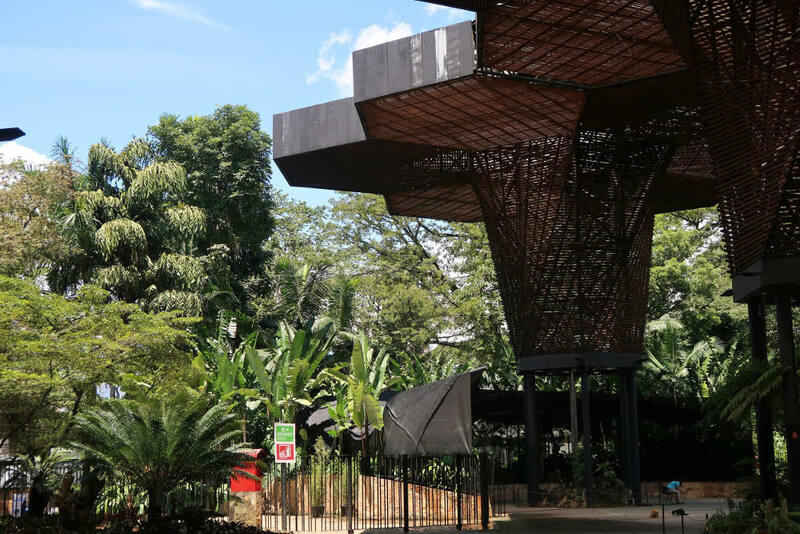 Parque Lleras is located in the Poblado and one of the best nightlife spots in Medellin. It’s a place to eat, drink and dance and generally, enjoy yourself. It’s full of restaurants, bars and cafes. Given the atmosphere and amount of people that flock there in the evenings, you find there’s plenty of security. You can’t visit Medellin and not go to Parque Lleras. Saturday night is usually the busiest so make sure you’ve got your dancing shoes on and you’ll be in for an eventful not without a doubt. Avoid flashing your electronic devices. Try not to walk alone at night. Please don’t carry lots of cash around with you. Avoid entering bad looking neighbourhoods and streets. Use ATMs inside shopping and food stores. Medellin is generally safe for tourists. Just use your common sense and apply the tips I have mentioned and everything should be fine. Now you can concentrate on having a good time. Convinced To Travel To Medellin Yet? So, when will you find the time to explore these attractions and discover what to see in Medellin? 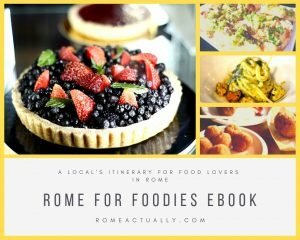 With so much fun to be had in this bustling city, I hope you feel motivated to try these options whilst spending your precious time. Whether it’s people watching in the Plaza Botero, or indulging in tango dancing at Salon Malaga with locals, you can be sure that you’re engaging in the top things to do in Medellin. Author Bio: Daniel James from Layer Culture is a cultural traveller based in the United Kingdom. Daniel dedicates his time to exploring and learning about life in Latin America. Pick up your backpack and join him on his lifelong mission to uncover Latin American’s hidden gems – you may even become fluent in Spanish along the way.